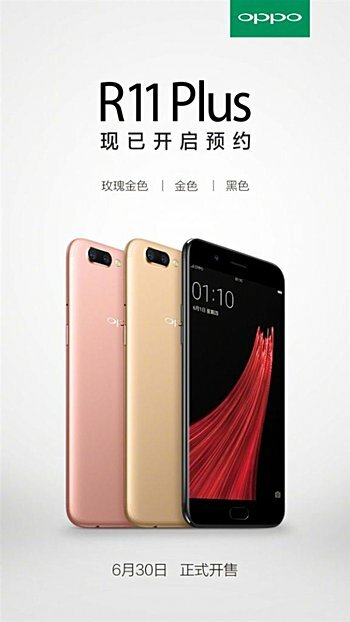 The launch date for the Oppo R11 Plus has been revealed. The device will go on sale later this week - June 30 - with China being the first market to get it. Pricing should be CNY 3,699 (around $540), while color options include gold, rose gold, and black. The R11 Plus is powered by Snapdragon 660 SoC and features a 6-inch Full HD display. RAM is 6GB, while internal memory is 64GB. The phone features a dual rear camera (20MP+16MP) and a 20MP selfie shooter. It runs Android 7.1.1 Nougat out of the box and packs in a large 4,000mAh battery. snap 660 if its so close to snap 821/0 than an oc can put it toe to toe and that would make these chips fantastic for most phone users. I'm looking to get one to develop on myself since I sold my S7 Edge Qualcomm China version.